CCOV (175 rue Saint Catherine West. 3rd basement. All attendees MUST RSVP before attending the event. Email us at admin@quebec-elan.org to confirm your presence. 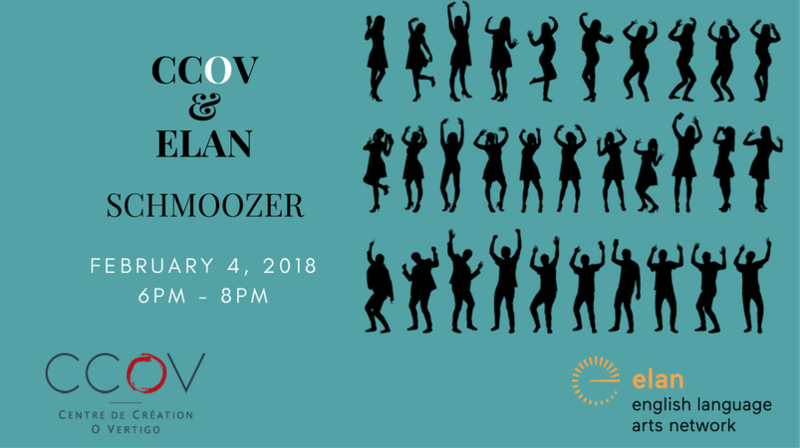 Centre de Création O Vertigo and ELAN come together to bring you the CCOV & ELAN Bilingual Schmoozer. French-speaking and English-speaking dancers artists of ALL disciplines are welcome to meet, greet, learn more about CCOV, ELAN, and each other! Centre de Création O Vertigo is proud to bring you DANCEOKÉ! The CCOV community is passionate about dance, so of course, we’re gonna get our groove on! Danceoké is similar to karaoke: music videos featuring easy-to-follow choreographed dances will be projected on a screen for all of us to follow and dance to! Not confident about your dance moves? Don’t worry about it. This is a fun ice-breaking activity and no one is obligated to participate, however, participation is strongly encouraged! CCOV and ELAN community! Be sure to sign up for Minute Market! The first 10 members to contact us at admin@quebec-elan.org will be given a minute spot to market their latest projects and/or upcoming events! Additionally, don’t forget to bring a door prize! Ideas include: tickets to your next show; a CD of your performance; or something completely different! Early in the event, Minute Market participants will be paired up (one English-speaker and one French-speaker per pair) to discuss their new projects with one another. During the Minute Market presentation, each person will present the project of the artist they were paired with. Remember, each participant has 1 minute to speak (2 minutes per pair). ELAN has plans for other interdisciplinary bilingual schmoozers in Montreal and is always looking for partners in the regions to help organize local schmoozers. Feel free to contact us (admin@quebec-elan.org) if you have ideas!